On October 28, 1647, an extraordinary debate occurred at Putney Church in London. Representatives of the New Model Army rank and file – Agitators – met with members of the Council of War – the grandees – in order to debate the terms of settlement laid out in the Heads of Proposals, The Case of the Armie Truly Stated, and The Agreement of the People, as well as resolve the problem of arrears and indemnity for the soldiers. The King had been defeated and the Civil War appeared to be drawing to a close, and now a new settlement had to be agreed amongst the prosecutors of the parliamentary cause. The grandees, represented by Cromwell and his son-in-law Henry Ireton, sought to defend the constitutional reforms put forth in the Heads of Proposals. This document, authored by Ireton himself, presented a moderate constitutional settlement that would secure the supremacy of Parliament within the traditional constitution of Crown, Lords and Commons. The Agreement of the People, in line with Leveller conceptions of popular sovereignty, sought to reform the English constitution by basing the rule of Parliament on the consent of the people as a multitude of individuals. The debate quickly focuses on an article in the Agreement that advocates the reform of the electorate. Cromwell, attempting to get clarification as to the precise meaning of the statement, asks whether the authors meant that the franchise should be redistributed in order to offset the overrepresentation of “rotten boroughs” or whether the right to vote was to be invested in each individual. 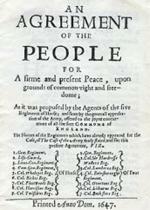 The particular clause of the Agreement reads: “That the people of England, being at this day very unequally distributed by counties, cities, and boroughs for the election of their deputies in parliament, ought to be more indifferently proportioned, according to the number of inhabitants.” Cromwell says that if by this the Agreement simply means a redistribution of representation as it already exists in the kingdom then he has not problem with the reform. If, however, the article in the Agreement means that “every man that is an inhabitant is to be equally considered, and to have an equal voice in the election of those representers…then I have something to say against it.” The distribution of the franchise thus becomes linked to the principles of popular sovereignty; in other words, the right to vote becomes the vehicle through which the people, as a multitude of individuals, express their sovereign powers. The question them becomes, who are the people? If parliamentary sovereignty is insufficient to protect the rights and liberties of Englishmen, then the people must be able to delegate and reassume their sovereign powers. This implies the notion of consent to political authority. The point of contention comes down to what a redistribution of the franchise means politically – does equality of representation merely mean the reform of the voting system in terms of eliminating what later reformers would refer to as “rotten boroughs”? Or does it entail the extension of the right to vote beyond the 40 shilling franchise? Much debate has revolved around the extent of the franchise that the Levellers were proposing. Early historians of the Levellers viewed them as radical democrats, espousing what was essentially a universal adult male franchise, one that would only exclude “delinquents” and “malignants.” C.B. 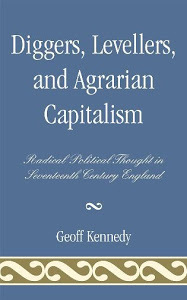 Macpherson famously interpreted the Levellers to be exponents of a possessive individualism in which they were nothing more than radical liberals whose conception of self-propriety excluded wage-labourers. Yet Macpherson’s interpretation is highly problematic, both in terms of his understanding of property in the mid-seventeenth century, but also in terms of his selective assessment of the historical record. This position is backed up by Edward Sexby, John Wildman, and initially, Maximillian Petty. Yet, it stirs up concern amongst the grandees, particularly Ireton, clearly the dominant intellectual amongst the grandees. Many soldiers, he says, are excluded from the franchise as it now stands; and many of those who did qualify for the forty shilling freehold franchise have since lost their estates. The choice, argues Rainsborough, is not between having rulers or no rulers, but rather, between right rulers and wrong rulers. It is not anarchy they seek, but rather, democracy. Petty jumps in by saying that the Agreement cannot be in favour of anarchy and social levelling since the very end of government is the maintenance of property.